Two off-duty members of the Dover (DE) Police Department were killed Sunday in an early morning crash west of Dover. The deaths of the two men, both in their early 20s, prompted an outcry of support and condolences from not only Dover but the entire state as news of the fatal crash spread. 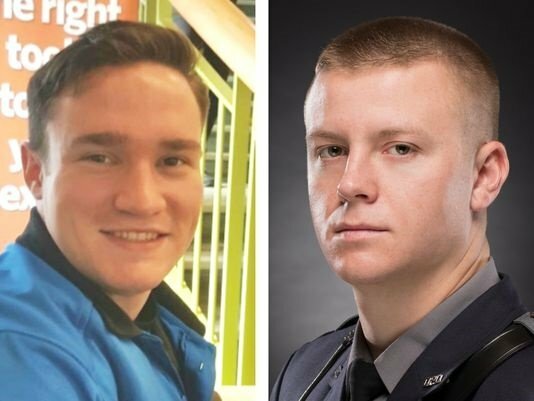 Dover patrolman, 23-year-old Robert E. DaFonte, was driving his 2016 Jeep Wrangler westbound shortly after 4 a.m. Sunday with 22-year-old James D. Watt inside his vehicle, said Master Cpl. Gary Fournier, a spokesman with Delaware State Police. DaFonte, of Hartly, and Watt, a cadet with the Dover Police Department, were headed westbound on Hazlettville Road, east of Nault Road, approaching a sharp right curve, Fournier said. Neither were working at the time of the crash, according to Dover police. The Jeep failed to make the curve in the road and drove off the south side of the two-lane roadway, down an embankment where it struck a utility pole, the driver’s side door taking the brunt of the impact, Fournier told Delaware online. The Jeep then overturned, ejecting Watt before coming to rest on the passenger side of the vehicle.